LOS ANGELES (AP) Russell Westbrook, doing his MVP thing back home. Paul George and Carmelo Anthony lighting it up. But where did Terrance Ferguson come from? 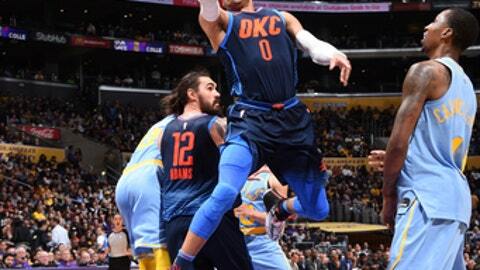 Oklahoma City might have found another potential star Wednesday night in Ferguson, a rookie who scored all 24 of his points in the second half to help the Thunder to a 133-96 victory over the skidding Los Angeles Lakers. Ferguson shot 6 of 9 on 3-pointers and threw down several spectacular dunks as Oklahoma City handed the Lakers their eighth consecutive defeat. He finished 9 of 12 from the field overall. It was the first NBA start for Ferguson, whose previous career high was seven points. George, thought to be interested in playing for his hometown Lakers at some point, matched Ferguson with 24 points. Anthony added 21 and Westbrook had 20 points, 12 assists and six rebounds in a successful homecoming. The reigning league MVP was born in Long Beach and went to college at UCLA. There was little of note for the Lakers to point to. After opening the game with a 10-0 run, they were thoroughly outplayed the rest of the night. The Thunder took control in the second quarter, outscoring Los Angeles 37-18. The Lakers were led by rookie Kyle Kuzma’s 18 points. They shot 41.3 percent from the field, while the Thunder shot 60.2 percent. Oklahoma City led by as many as 39 in the second half as Ferguson began to put on his show. Oklahoma City finished with 36 assists. Lakers: Julius Randle, thought to be somewhat undersized as a 6-foot-9 power forward, started his fourth consecutive game at center despite the return of Brook Lopez (ankle). Randle had been getting irregular playing time but in his first three starts averaged 20.7 points and 11.3 rebounds while shooting 60 percent from the field. ”Julius has been great all year. He probably deserves more playing time,” Walton said. ”He’s obviously been frustrated with me at times but he’s done a really nice job of when he gets called on, does a great job. He produces when he’s out there.” … Rookie point guard Lonzo Ball (shoulder) missed his sixth consecutive game. He is expected to return to practice Thursday. George insisted Ferguson’s big game was no fluke. Ferguson was just trying to soak in his breakout night. ”To have a game like that was pretty amazing,” he said. Ferguson, who opted to play in Australia for one year instead of going to college, said he hadn’t had a game like that in a while. ”It felt like I was back in high school,” he said. Thunder: Play at Staples Center again Thursday when they face the Los Angeles Clippers. Lakers: Play the middle game of their three-game homestand Friday against Charlotte.